1.Artificial faux sheepskin fur,Clean and eco- friendly. 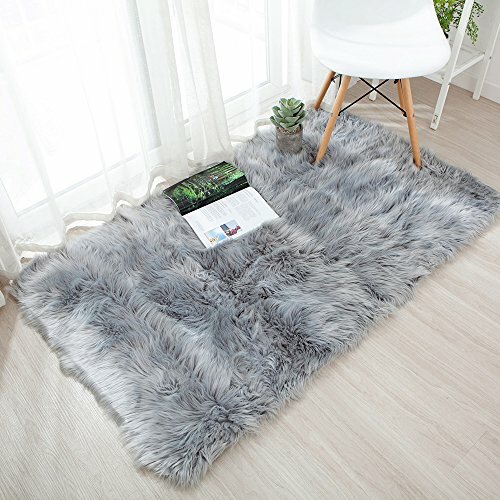 OJIA faux Sheepskin fur rug make with the Artificial faux sheepskin fur,it can absorb the water in the air.Being thick helps it to maintain heat in a room and offer you a nice warm feeling without feeling cold.Will not crush, fade, mold, mildew or rot. 3.For all seasons and any style of home. Great for any age, from children to the elderly. Luxurious & comfortable.Warm in the winter/cool in the summer.Environmentally friendly dyes .You can place it in the living room so as to have a soft and cozy spot for the kids to play!Makes the perfect addition to any modern or classic decor in your home.Suitable to use on tiles, lino, wooden & laminate floors. 4.Add style to any room.Also ideal as a rug or draped across your sofa and favorite armchair. OJIA faux sheepskin fur rug suitble for the sitting room ,Bedroom ,Dinning room,Comfort Carpet, Wedding Gift, Housewarming Gift.You can also use this rug for some popular areas to place our Faux Sheepskin Rug include in front of a fireplace, beside your bed or in the center of a seating area. Easy wash by yourself.hand washnable in 30 degree water ,don't bleach,don't iron,hand dry. NOTE: The fur rug will shed hair when you receive, it's a normal phenomenon.You can shake off in the ventilation .Colors may differ slightly due to screen settings, etc. Do you want your home to look warm and elegant?OJIA high quality faux sheepskin fur to hug you!Our rug adds warmth and softness to any room. Material: Front side: Artificial faux sheepskin fur; Back side: Genuine Soft White Suede backing. Size: approx. 2 x 3 Feets /⌀ 3 Feets /3 x 5 Feets / ⌀ 3 Feets /4 x 6 Feets.we measure it from wool to wool . please allow 1-2cm differs due to manual measurement. Give your home a touch of luxury with OJIA faux sheepskin fur rug, It's super soft and soothing to promote sleep while providing exceptional comfort,Also best for Yoga and Meditation. OJIA home decor fur rug a easy way to spruce up your living room, bedroom,sofa, or children's room with a bright and colorful accentetc.keep warm during cold winter weathers and Great decorative rug for any bedroom.